Value of card: What's two times zero? What makes this Diamond King so atrocious? Remember Johnny Ray? Neither do we. 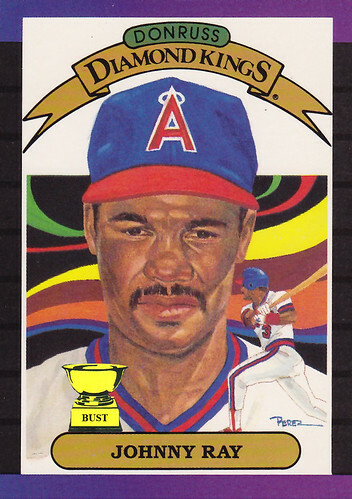 The good folks at Donruss sure remembered him, though, as they made him a Diamond King twice. Once? OK, fine. But twice? What, was Tony Armas not available? Even the artist couldn't believe he had to draw this guy again, spilling his paint palette all over the background before getting started. Thankfully, Ray's saving Diamond King grace, as in real life, was his mustache. Look at the detail on that thing! If you look closely, you can even see a speck of snot caught in it off to the left. Ray is my favorite baseball player of all-time! Two Diamond Kings isn't enough for Ray!